The AA601, a rode counter for glass bridge PC or PLC display, connects to the on board computer for monitoring of the length of rode deployed through the windlass. Suitable for DC electric windlasses using either a rope/chain or an all-chain rode and for hydraulic or AC powered windlasses using all-chain rodes, the AA601 can be fitted to almost any windlass. Rode length monitoring from the onboard computer. Displays feet, metres or fathoms. Pre-programmed calibrations for rope/chain rodes. Connection via RS485 serial port or USB direct. Custom programmed USB direct adaptor eliminates COM port issues. An alarm warns skipper when anchor is close to docking. 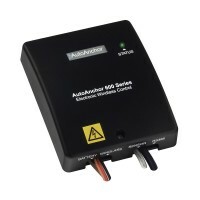 Combine with the AA550RC, AA500C or AA150 for multiple stations. Logs hours of windlass operation for maintenance. Choice of PC display options – digital, vertical bar, round bar or dial display. Installation and use is intuitive with “plug and play” software.